This final episode ended up being pretty action-filled, but sadly, we’re left with quite a few questions. Let’s start with a simple one: in the screenshot, why does only one of the wounds have blood? Even if blood were taken to summon the angel, wouldn’t there still be blood on the clothes? The more pressing question is why was Yuu able to recover from being possessed by both an angel and a demon with basically no side effect? In my opinion, that has been the weakest point of this second season, despite its merits over the first season. They seem to hand-wave a lot of Yuu’s possessions even though they feel like they should be more harmful to him. A couple of quick observations to finish off this season/series (is there going to be another season?). First off, did anyone else notice that Narumi appeared in the final scene of the ending song to fill the empty spot on the bench? I guess he’s officially part of the gang now. Also, I’m glad my prediction about Kimizuki’s sister being in the box was correct…that random scene with her wasn’t just forgotten. Overall, better second half than the first half…stuff actually happened and the school setting was thrown away. Still a lot of questions, though, so maybe it’s time for me to pick up the manga. We got a pretty interesting episode this week as the plots that have been swirling around since season one start to form. It’s actually starting to look like a large portion of these plans were masterminded by Mahiru and not Kureto, as previously suggested. Guren also makes for a nice potential antagonist for the final episode because he truly seems to be a nice person, but is seemingly corrupted by the demon Mahiru in his weapon. The part that I didn’t fully understand was this: is Guren’s “second personality” just how people perceive his possession by the demon or does he actually have a second personality that surfaces when the demon speaks to him. 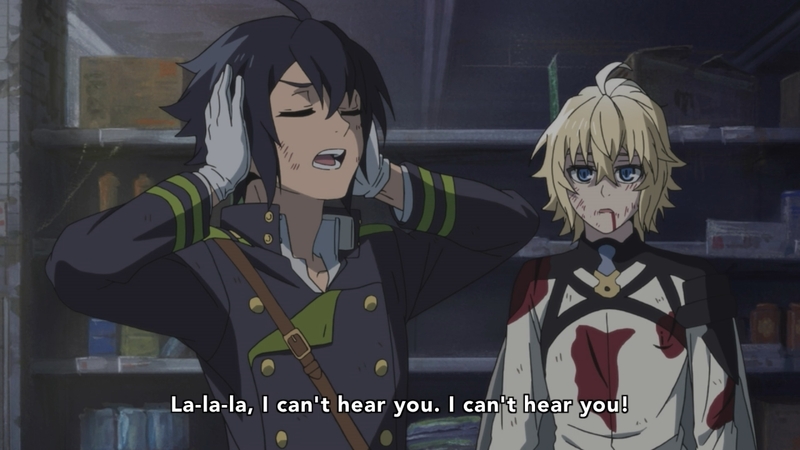 In next week’s episode, hopefully we finally find out what Owari no Seraph is (have we actually had an explanation?). I also have make the obligatory movie reference…we really need to find out “what’s in the box?” My guess is that it’s Kimizuki’s sister because it seems somewhat appropriate. It might also be interesting to see Yuu and Mika work together for once, but it seems unlikely because the preview suggests that Yuu will once again lose control. Oh well…I can only hope. Well, I can only imagine the fanfics that are going to come from this week’s episode. It’s like they weren’t even trying to hide the stuff between Mika and Yuu. In the interest of sanity, I’m going to leave it at that. Anyway, Yuu and Mika are finally reunited, but it comes at the cost of turning Mika into a full vampire. I’m going to laugh if that ends up being the reason the humans use to reject Mika. Also, is Yuu just hopelessly optimistic or does he really not expect to get court-martialed when he returns to the group? I’m not exactly sure what I’m watching in the preview for next week’s episode. 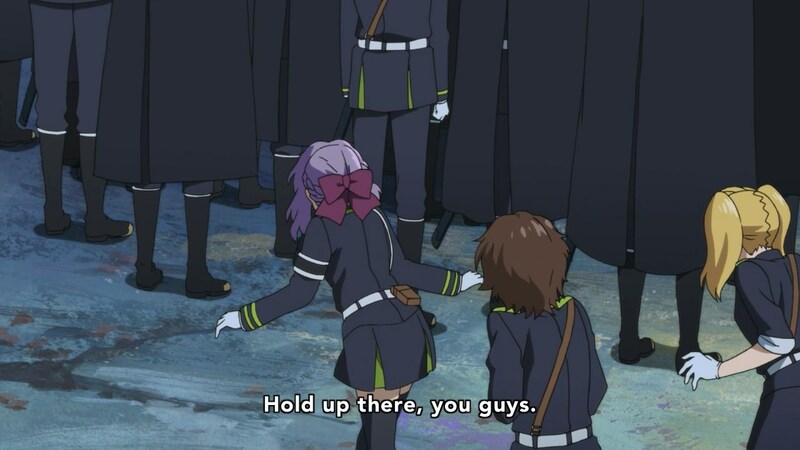 It almost looks like Shinoa gets herself isolated from the rest of the group, possibly for defending Yuu. If the episode is titled Arrogant Love, does that mean that she’s going to use that as the reason? I thought it might be a vampire ambush, but they don’t look like they’re attacking the humans in the preview. Are Mika and Yuu supposed to show up just in the nick of time to save Shinoa? Or what if it’s not even related to Yuu? What if it has something to do with Kimizuki finding out about her sister or something? Admittedly, this is very unlikely because it makes little sense for him to find out his sister is being used as a test subject, but I guess it’s possible. Wow…this week’s episode was actually pretty full of content. Ashuramaru starts by making the first mention of angels in the series, claiming that they are somehow worse than demons. For some reason, I’m actually inclined to believe her. 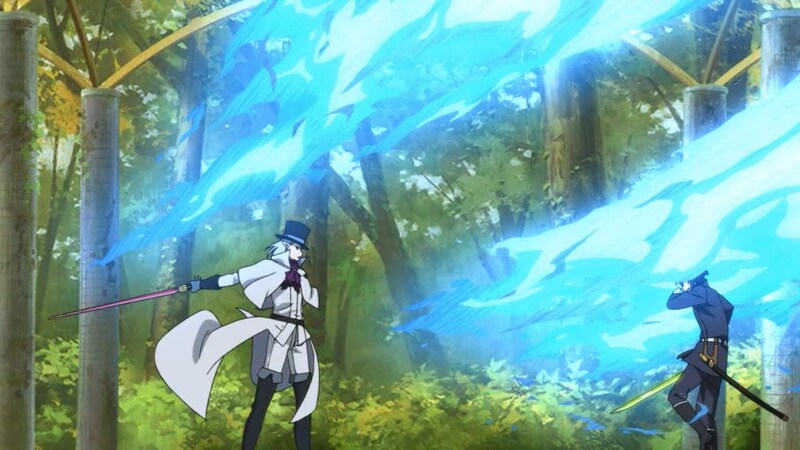 Yuu attempts to use the demon power again…once again loses control, but not quite so extravagantly as last time. I’ll get back to this in the preview. Finally, Mika makes his appearance, giving us a pretty cool fight while he desperately tries to save Yuu by himself…and surprisingly, Yuu’s team is okay with that. I guess they see Mika as a potential ally, which I agree is likely to happen. Oh yeah…also, the mentor team is finally dropping, as we expected all along. I didn’t quite expect it to go down like this, though. 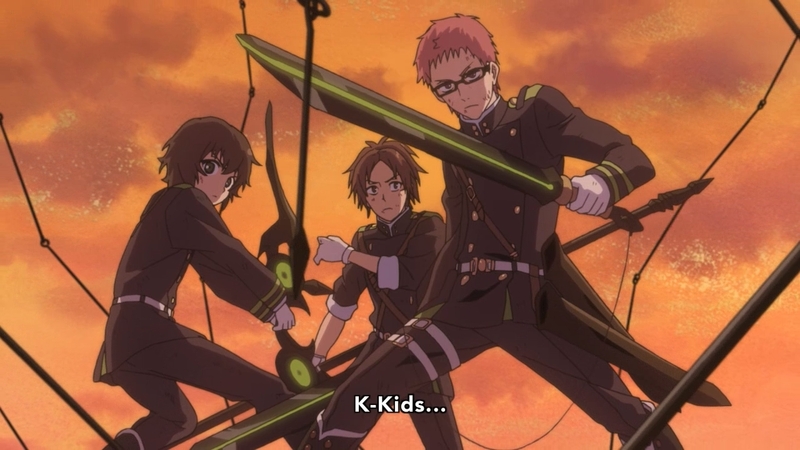 Yuu’s team is pretty much screwed in the eyes of the rest of the soldiers. Getting so many people killed…how do they come back from this? Now let’s talk the preview. It shows Yuu conscious and seemingly okay…I guess he’s going to offer Mika his blood when to sate his vampire urges or something. That’s not too important. What really gets me is that there is seemingly no trace that he WAS ACTUALLY DEAD at the start of this week’s episode. Does he just get away with it? Seems a bit fishy…I guess we’ll see next week. 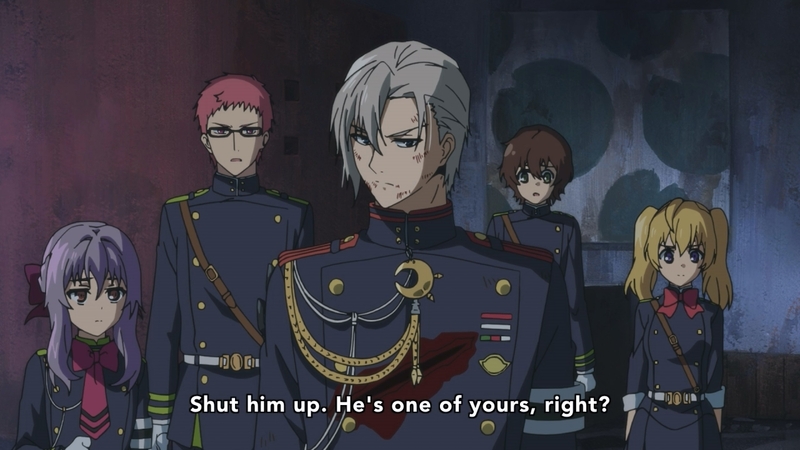 Owari no Seraph S2 Episode 8: We didn’t really need that guy, right? This week’s episode was pretty good…it started nicely by jumping right back in to the action and bringing the opening song from the first season back as fight music. Yuu’s obsession with family is starting to get a bit excessive, though. I actually found the last scene to be a bit funny…Yuu realizes that he’s already taken his limit of two pills and decides not to just take one more pill, but to take multiple pills. I guess if you’re already screwed, you might as well push it, right? I think we were all expecting Yuu to go berserk again, but it looks like simple death is all we get for now. Well, the preview segment clearly shows Yuu fighting again. He doesn’t seem to have gone berserk either. I’m curious, though…it shows Mika clinging on to a body which is very likely Yuu’s body (who else would he care to hold?). 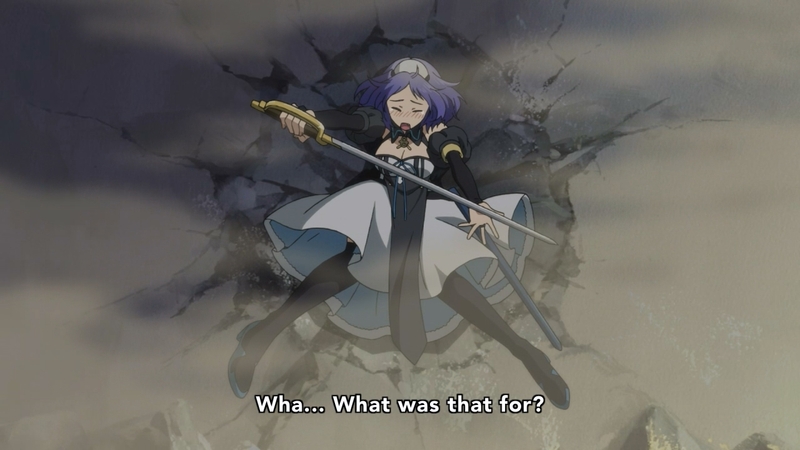 Is that Yuu’s unconscious body after he finishes his fight? Or was the beginning part of the preview some sort of illusion and Yuu remains a lifeless corpse for the entire next episode? Frankly, I’m fine with either option. 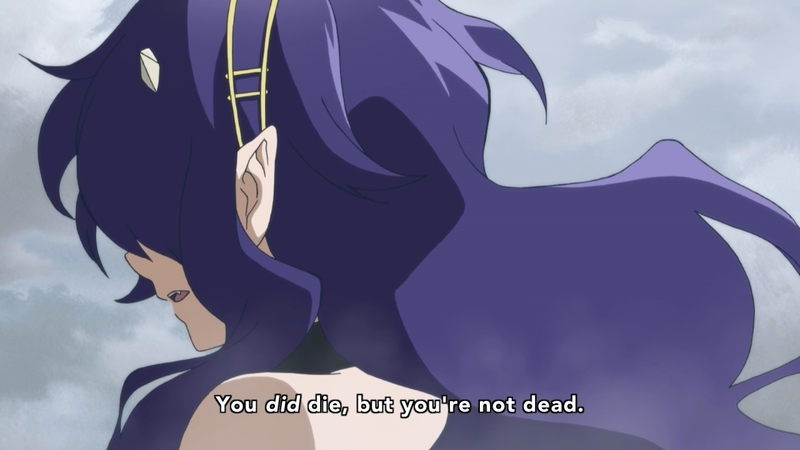 Author marthaurionPosted on November 30, 2015 Categories Owari no SeraphTags seraph of the end, vampires8 Comments on Owari no Seraph S2 Episode 8: We didn’t really need that guy, right? So the fight against Crowley begins…my initial complaint about the episode is I wish they hadn’t spent so much time arguing about whether they would save their comrades. We could have had so much more action. That aside, I do like how green they show Shinoa (you’ll notice that she often gets pushed around by her team when it comes to decisions), but I’m more looking forward to the moments when she actually starts trusting her decisions. Also, please Shinya…shoot the guy instead of trying to say “Checkmate”. What the heck, man? This week’s episode ends on an awkward cliffhanger…I’d say it actually really possible that Yuu gets slashed by Crowley to potentially trigger his berserk mode again. I guess Mika could also show up to save him, but I still don’t think he’ll show up next week. The preview doesn’t really give too much information to help with speculations. Maybe the red attacks indicate that it’s Guren attacking? Did Yuu’s attacks turn red the last time he went berserk? We got a nice throwback to the opening song of the first season in this week’s episode (it’s the song playing when Aihara stands up to “attack” Mika in case you didn’t notice). Another nice episode, this time focused on Mika. Despite how much he’s trying to embrace his vampirism to save Yuu, he’s still able to gain a human’s trust. This week’s episode also proposes a curious divide between the vampires and humans…for whatever reason, vampires don’t consider the act of suicide to protect comrades. I’m really interested to know why…lack of fear of death? No respect for torture? Or just no care for camaraderie? That aside, next week’s episode starts to battle against Crowley. Given the introduction of the vampires with Crowley at the start of this week’s episode, I’m actually starting to question whether they will be killed in this assault (online opinion of these vampires seems to be good). Also, given that the title of the episode is Shinya and Guren, it’s very unlikely that Mika will show up next week. That’s probably reserved for the week after…perhaps he shows up at the end of the episode. 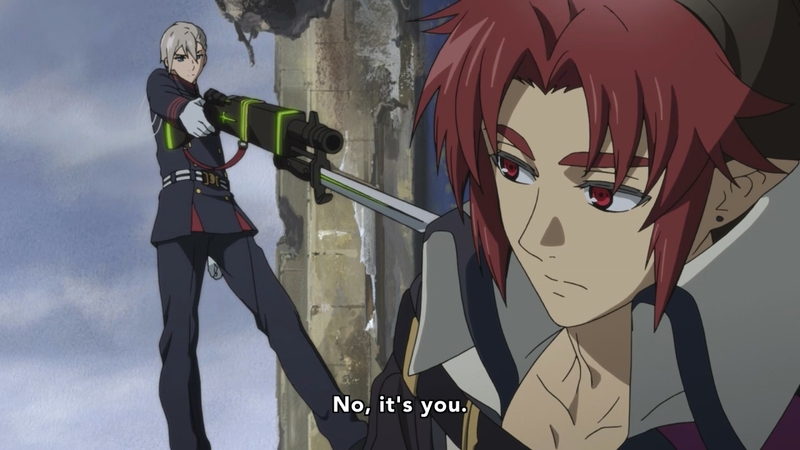 Anyway, I’ll be curious to see how Shinya and Guren fight together…are they supposed to be close or something? So I guess next week’s episode is the rematch against the vampire noble from the first season, Crowley. Based on the preview, it looks like Mika will also make his appearance in the episode…though it’s not clear whether he’s showing up to assist Crowley or just to fight a different squad. It might still be a bit too early in the season for Yuu and Mika to meet up again. It’s very possible that next week’s episode will just have the events leading up to the rendezvous between Guren’s team and the main characters, now that I think about it. 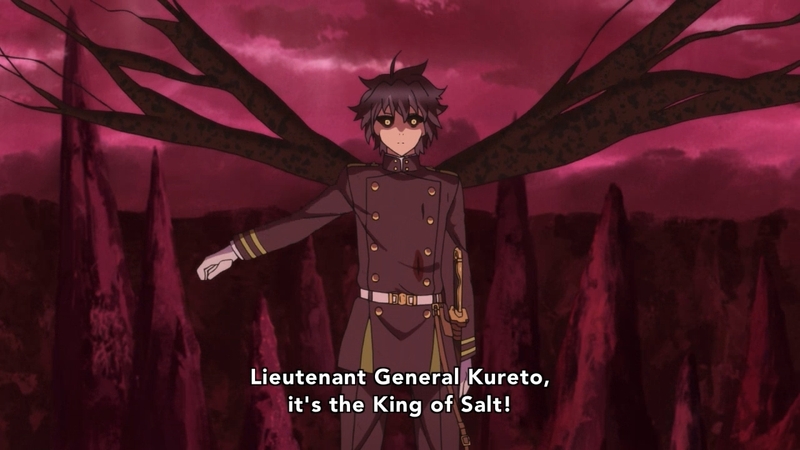 I might be nuts, but Yuu’s character is becoming less frustrating to watch than he was in the first season. He takes his losses in stride and seems to be fairly levelheaded in combat. That being said, he has only faced other humans so far this season, so we have no way of knowing if he will continue to lose it when facing his vendetta. I’m still not convinced that he can keep it together against Mika. That being said, the fight this week was pretty fun to watch…though I’m curious just how strong the other teams are with all of their criticism. I guess next week’s episode is finally the start of the fighting between humans and vampires. I’m getting the sense that these new mentors for our main characters won’t last the season…they’re probably just more fodder to strengthen our heroes. The title of the episode seems pretty interesting, though…it suggests that other captured humans will join in the fight against the vampires. Will they even be helpful with normal human strength or will it be another classic case of “strength in numbers”? Question: did they ever mention before that demons were originally vampires? Kureto said it so casually to Guren this week that I wasn’t sure whether I had missed it somewhere. That aside, I suppose this week’s episode was meant to show Guren in a good light? Even though the main characters are suspicious of Guren, Kureto seems to see him as too nice a soldier, caring too much for his comrades. I’m almost feeling sorry for him…it’s starting to feel like everyone’s out to get him. Anyway, next week’s episode looks to be the start of the fighting with the main characters moving to Nagoya to take on some vampire nobles. It looks like the main focus of this series is to preempt an incoming vampire assault by striking first. As a final note, I don’t usually say things about the endcard for an episode, but this week’s was particularly curious. It shows Krul and Ashuramaru lying together…now that we’ve established that demons were formerly vampires, is that picture meant to suggest some sort of prior relationship between the two?